The tocororo or Cuban trogon is the island's national bird. Its white, red and blue feathers match those of the Republic’s flag. It exists only in Cuba. This species is endemic to Cuba and exists nowhere else. Its scientific name is Priotelus temnurus. Most Cubans call them tocororo (sometimes tocoloro) for their onomatopoeic song sounding something like this: toco-toco-tocoro-tocororo. The indigenous people of Cuba (known as the Taíno, a subgroup of the Arawak of the northeastern South America) named it guatiní. The tocororo is part of a larger family of thirty-nine globe-spanning tropical birds of the Trogonidae or trogon genus. The English name for the tocororo is Cuban trogon. It is considered to be among the most unique and exotic of trogons. The health and well-being of trogons across equatorial landmasses serves as biological barometer of tropical forest integrity. Many ancient peoples (and some still today) consider the trogon a harbinger of good news, or a signal for a better life ahead. Some believed seeing or hearing a trogon suggested a beneficial communication link with higher spiritual powers favoring their future. This enduring believe is good for the status of the trogon, and a deterrent to those who stalk rare species for profits. 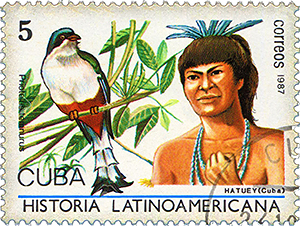 1987 Cuban stamp celebrates the tocororo and commemorates island the contributions and heritage of indigenous people. The tocororo is the national bird of Cuba. Its white, red and blue colors match those of the Republic’s proud flag. It cannot live in captivity. It dies of sadness if caged – reflecting the unquenchable thirst for sovereignty and dignity of the Cuban people. Many Cuban enterprises, organizations, restaurants and small businesses include the word tocororo in their names. Movies, cartoons, poetry and literature feature the tocororo as an icon, character or metaphor. Tocororos inhabit the entire main island and its thousands of surrounding islets. Their favorite habitat is woodland forests, near fresh water, and dense with shrubbery and thickets to shade them from the tropical sun. Adult tocororos dine on nectar, fruits, berries and insects in the forest. Parents feed their babies masticated versions of the same. 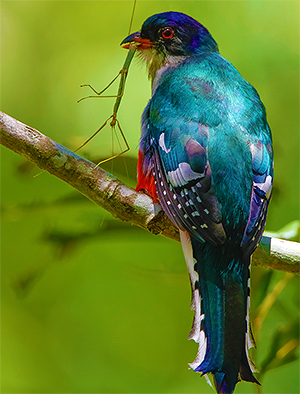 The Cuban trogon nests in tree cavities resulting from rot or abandoned woodpecker nests. Its lays three to four white eggs each spring. Both parents help feed and rear the kids. Adult tocororos dine on nectar, fruits, berries and insects. Parents feed hatchlings masticated versions of the same. Unlike most other birds, it can hover mid-flight when feeding, flirting or mating. However its general flying technique is ungainly. They tend to group and fly in pairs issuing loud squawks when airborne. If distressed or in danger they send out a stealthy audio alert nearly impossible to locate. Tocororo feathers are captivating. Its head is aquamarine, chest white, and tummy red. Its back is a metallic iridescent green, and wings are checker white and black. Its tail striped blue, black, green and white with dramatic scallops on the sides and bottom. Its upper beak is dark and the lower beak red, as are its penetrating eyes. Its length is between ten and eleven inches (25.5 to 28 cm). The sexes are similar while the female is somewhat smaller and the red on her tummy paler. Fortunately, in contrast to most endemic bird species in Cuba, the tocororo is not endangered. It is estimated there are about five thousand viable mating pairs. The population declines at the rate of ten percent every ten years. When you come to Cuba and venture outside major cities it is likely you’ll witness a tocororo, one of forty-one bird species existing exclusively on the grand island of the Caribbean. Learn more here about the natural and social history of the Trogonidae family.